I'm in Bennington, Vermont this weekend because we're hitting a museum in Massachusetts and going biking. Bennington was the Vermont home of Shirley Jackson, with whom I've been obsessed since high school. I've collected some Shirley Jackson Vermont reading to do while I'm up here. Shirley Jackson Road Trip, the report I'm really looking forward to this one. 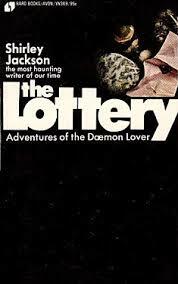 And, to be honest, I brought my copies of Life Among the Savages and The Lottery/Adventures of the Daemon Lover with me, so they could have the experience of being in the same town where Shirley lived. I've had The Lottery so long it smells of mildew. I hate when that happens. I hope to have at least one Jackson-related photo to share before the weekend is over.